Lit & Luz Festival Chicago 2014 "Archive"
October 15th-18th, MAKE Literary Productions introduces the inaugural Lit & Luz Festival—one-of-a-kind series of events featuring renowned authors and visual artists from Chicago and Mexico City in cultural exchange and conversation. Through readings, performances, visual art, and the 2014 theme “Archive,” the participants will explore both Chicago and Mexico City’s historical contexts; how we document our lives and our culture in a digital age; and translation between language and artistic mediums. 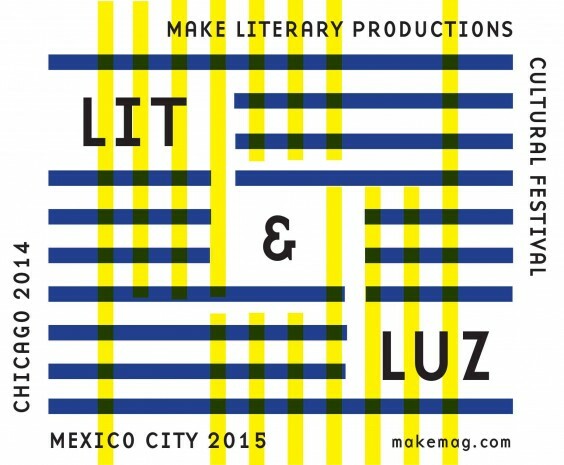 Most importantly, the festival will highlight contemporary literature and visual art from Mexico City. The first event on Wed, Oct. 15, will take place at the Poetry Foundation in River North and feature Mexican poets Valerie Mejer and Luis Felipe Fabre; Thursday, Contratiempo and the University of Chicago’s Katz Center for Mexican Studies co-sponsor a lively conversation on translation at Cultura in Pilsen; On Saturday, the festival will culminate in a “Live Magazine Extravaganza” at Co-Prosperity Sphere in Bridgeport. For the event, seven groups of collaborators have joined up to create short performances, bringing print to life in this literary spectacle hosted by stand-up comedian Adam Burke and Southside Ignoramus Quintet’s Ruth Guerra. Throughout the four days, visiting participants will give individual readings and lectures at institutions throughout Chicago, including DePaul University, Roosevelt University, the University of Chicago, University of Illinois Chicago, the School of the Art Institute of Chicago, and Northwestern University. Full details below. The title of the festival is a nod to literature, the lights of the cities, the luminescence of a painting, and the glow of the screen. Full participant bios follow the schedule. Co-sponsored by the Department of Spanish and Portuguese, The Center for the Writing Art at Northwestern, and Latina and Latino Studies Program at Northwestern. Author Álvaro Enrigue reads from and discusses his book Hypothermia(Dalkey Archive). Valeria Luiselli reads from and discusses her recently translated titles Sidewalks and Faces in the Crowd (Coffee House Press) as part of Roosevelt’s Fall Reading Series. MAKE Mexican Poets Night for the Poetry Foundation’s Poetry Off the Shelf with Luis Felipe Fabre, Valerie Mejer, and Daniel Borzutzky. Featuring readings in English and Spanish, as well as a presentation from Action Books’s Johannes Goransson. Valeria Luiselli, Luis Felipe Fabre, and Susana Iglesia in conversation at the University of Chicago, noon. International Aura Estrada Prize-winning, Mexico City-based author Verónica Gerber Bicecci will read from her essays and art writing and discuss her interdisciplinary work. A conversation on translation with Mexico City novelist and MAKE editor Brenda Lozano; translator and poet Daniel Borzutzky (The Book of Interfering Bodies) and Univ. of Chicago professor Mauricio Tenorio. Moderated by contratiempo’s Moira Pujols. Novelist Brenda Lozano, poet Luis Felipe Fabre, and novelist Aguillón-Mata will read from their work and then discuss literary publishing in Mexico City with SAIC’s Janet DeSaulniers. Multi-disciplinary and multilingual, audio+visual performances and conversations will bring an issue of MAKE alive on stage and showcase unique collaborations between writers and visual artists from Chicago and Mexico City. This event will move between Spanish and English and through the theme, “Archive,” explore the contexts in which both Chicago and Mexico City exist, as well as how we document our lives and culture in a digital age. Directed by Salonathon’s Jane Beachy, hosted by comedians Adam Burke & Southside Ignoramus Quintet‘s Ruth Guerra, with music from Ida y Vuelta and Charly Garcia of the DJ Collective Sonorama. Set design by ChiDM’s Roman Titus and Mexico City visual artist Alejandro Almanza Pereda. Aguillón-Mata is a Mexican writer. He publishes essays and fiction in several Mexican and American magazines, both printed and virtual, some of which are Armas y Letras, Avispero, Letras Libres, and MAKE Magazine; he has also published the books of fiction Quién escribe (Paisajista), 2004, and Tratado (De una zona privada), 2013. His bilingual website can be found at http://aguillon-mata.com and his Twitter account at @AguillonMata. Verónica Gerber Bicecci (Mexico City, 1981). Visual artist who writes. She makes pieces that are texts and texts that are pieces. Her projects explore the infinitesimal trails of things that can’ t be heard nor seen. Her book Mudanza [Moving Out] (2010, Ed. Auieo — Taller Ditoria) narrates the transformation of five writers into visual artists. She is a fellow in the Young Creators FONCA Program. In November, 2013, she received the International Aura Estrada Prize for Literature. To learn more about her work: veronicagerberbicecci.net. Álvaro Enrigue (born 1969) is the award winning author of four novels and two books of short stories. He has been translated into multiple languages, including German, English and French. In 1996, Enrigue was awarded the prestigious Joaquín Mortiz Prize for his first novel, La muerte de un instalador (Death of an Installation Artist). Since then it has been reprinted five times, and in 2012 it was selected as one of the key novels of the Mexican 20th century, and anthologized by Mexico’s largest publishing house, Fondo de Cultura Económica. His books Vidas perpendiculares (Perpendicular Lives) and Hipotermia (Hypothermia) have also been widely acclaimed. Luis Felipe Fabre was born in Mexico 1974. Fabre was awarded a scholarship for Young Creators from the Fondo Nacional de Cultura y las Artes from 2004-2005. He has published Leyendo agujeros, ensayos sobre des-escritura, antiescritura y no escritura (2005), a collection of poems Cabaret Provenza (2007) and La sodomía en la Nueva España (2010). Brenda Lozano was born in Mexico in 1981. A narrator and essayist, she contributes to Letras Libres and Día Siete, among other publications. She is the author of the novel Todo Nada. She studied Latin American Literature at the Universidad Iberoamericana and is the MAKE Spanish Language Editor-Prose. http://colinmarshall.libsyn.com/s3e17-youth-is-overrated-with-brenda-lozano. Valeria Luiselli was born in Mexico City in 1983 and grew up in South Africa. Her novels and essays have been translated into many languages, and her work has appeared in publications including the New York Times, Granta, MAKE, and McSweeney’s. Some of her recent projects include a ballet libretto for the choreographer Christopher Wheeldon, performed by the New York City Ballet in Lincoln Center in 2010; a pedestrian sound installation for the Serpentine Gallery in London; and a novella in installments for workers in a juice factory in Mexico. She lives in New York City where she is completing her doctorate at Columbia University. Her novel, Faces in the Crowd and her essay collection, Sidewalks weretranslated to English and released this year by Coffee House Press. Valerie Mejer, born in Mexico City, is a poet and painter. For her book De Elefante a Elefante, she was awarded the Gerardo Diego International Award for Literary Research by the Spanish Government. She is the author of six books of poetry and five translations. Forthcoming works include an anthology of her poems, Rain of the Future (Action Books, 2013), and a long poem, This Blue Novel (2014). Alejandro Almanza Pereda (b. 1977, Mexico City, Mexico) lives and works between Manhattan and Brooklyn, New York and Mexico City, Mexico. He earned a BFA from University of Texas at El Paso (2005), attended the Skowhegan School of Painting and Sculpture (2004), and is an MFA candidate at Hunter College of The City University of New York (2015). He has been a resident at the Bemis Center for Contemporary Arts, Omaha (2011), while his awards and honors include grants from the Harpo Foundation (2010), Cisneros Fontanals Art Foundation (2008), and the National Fund for the Arts and Culture (FONCA) Programa Jovenes Creadores Mexico City (2005, 2007). Daniel Borzutzky grew up in Pittsburgh, Pennsylvania, of Chilean heritage. He has published a collection of fiction, Arbitrary Tales (2005), a poetry chapbook, Failure in the Imagination (2007), and two full-length volumes of poetry, The Ecstasy of Capitulation (2007), and The Book of Interfering Bodies (2011). Originally from the UK, Adam Burke began performing stand-up after writing a piece on comedy for a Chicago magazine. Before long, Burke became a fixture at Midwestern shows and showcases. He has appeared at the Bridgetown Comedy Festival in Portland OR, as part of the Just for Laughs Chicago festival for four years running, and at the local stage of Funny Or Die’s Oddball Comedy Festival. In addition, he has opened for a wide variety of comedians including Marc Maron, Jeff Ross, Hannibal Burress, Hari Kondabolu, Maria Bamford, Michael Ian Black, Kumail Nanjiani, John Oliver, Tracy Morgan, Aziz Ansari, and many more. Burke released his debut album Universal Squirrel Theory on A Special Thing Records in 2012. He was voted Best Standup in Chicago by readers of the Chicago Reader in 2014. Joel Craig lives and works in Chicago, IL and is the author of the poetry collection The White House (Green Lantern Press, 2012). He co-founded and curates the Danny’s Reading Series, and is the poetry editor for MAKE: A Literary Magazine. Don De Grazia is the author of the critically acclaimed novel, American Skin(Scribner/Jonathan Cape). His work has appeared in The Chicago Tribune, The Chicago Reader, Newcity, TriQuarterly, The Outlaw Bible of American Literature, The Italian American Reader, Rumpus, The Great Lakes Review, MAKE Magazine, and other publications. He is also a screenwriter in the Writers Guild of America (east) and co-founder/co-host of Come Home Chicago, a live event series dedicated to celebrating the Chicago storytelling tradition in all its forms. Kirsten Leenaars is a Dutch artist whose minimal and open studio is found within her home on the north end of Humboldt Park. Crafting childlike sets, Kirsten creates spaces where her participants often play themselves in collaborative narratives. She in an Assistant Professor of contemporary practices at the School of the Art Institute. Kathleen Rooney is a founding editor of Rose Metal Press, a nonprofit publisher of literary work in hybrid genres, and a founding member of Poems While You Wait, a three-person team of poets and their typewriters who compose commissioned poetry on demand. A winner of the Ruth Lilly Fellowship from Poetry magazine and the Gatewood Prize from Switchback Books, she is the author of six books of poetry and nonfiction. She lives in Chicago. Irvine Welsh is the author of Trainspotting and most recently, Skagboys.